Dragons exist, and not just on Westeros. 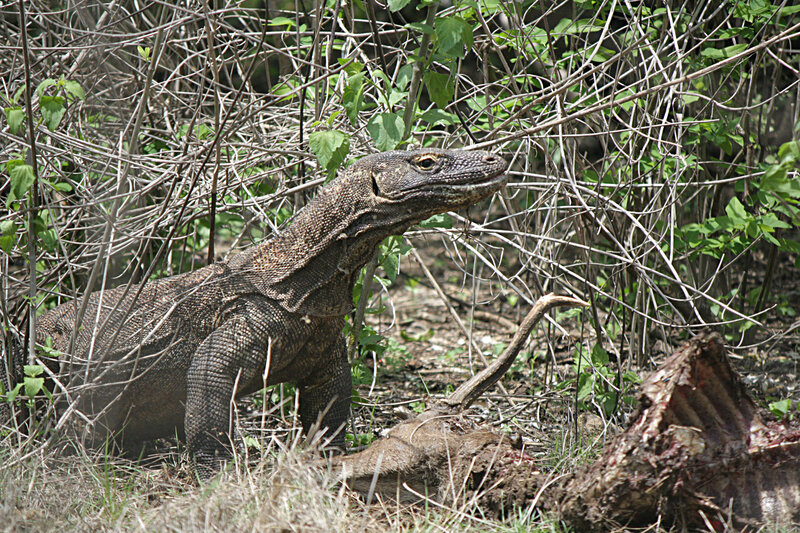 My encounter with Komodo Dragons in Indonesia. 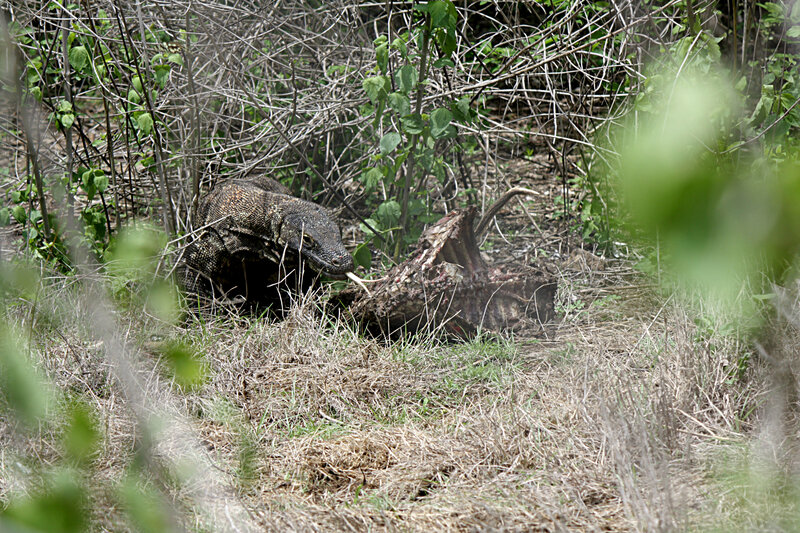 An adult Komodo Dragon approaches a deer carcass. I stared in trepidation at the long, smooth stick offered to me. Expecting a hard day’s hike ahead of us, I turned to our guide, a national park ranger and asked, “Rough terrain?” His sunbaked face split into what can only be construed as an amused smile, as he said, in broken English, “Yes, and also to fight Komodo Dragon.” I looked at him in utter disbelief. A relic from the age of the dinosaurs, the Komodo Dragon is the largest lizard on theplanet, capable of growing up to 10 feet in length. It is known to outrun men, swim long distances in choppy seas to reach other far flung islands and possess a venomous bite. And I was meant to fight one off with a stick. “Komodo Dragon bite ranger yesterday. Leg gone,” he continued nonchalantly. 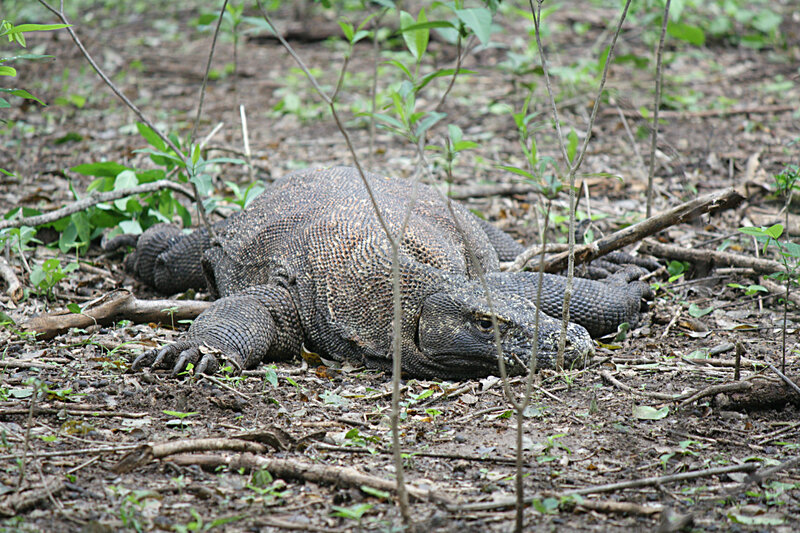 While the horrific prospect of losing my limbs to the Komodo Dragon’s voracious appetite nearly sent me running back to our rickety boat, I was also drawn to the adventure that lay ahead – the chance to trek the rugged volcanic landscape of the famed Komodo Island and see the near mythical dragons in their natural habitat. The Komodo National Park consists of a cluster of volcanic islands close to the Indonesian island of Flores. Komodo Island, the largest in this UNESCO World Heritage site, is home to about 2,500 Komodo Dragons and offers the best opportunity to see them in the wild. However, its location in the middle of a risky sea route and lack of amenities on nearby islands, can make it difficult to access. The only way to get to the island is via boats chartered from the small town of Labuan Bajo on Flores or as part of dedicated cruise and dive groups. 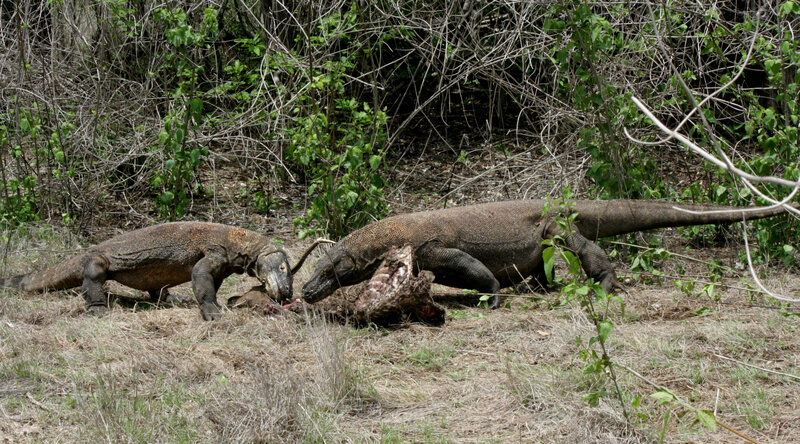 Most tour operators prefer making trips to the nearby island of Rinca, which is also home to several hundred Komodo Dragons, and easier to get to. However, it was the lure of the fabled Komodo Island that prompted us to risk the journey there. Stepping off the boat and onto the rickety jetty, I was greeted by aquamarine waters gently lapping the edges of a pristine, white beach. Lush, verdant slopes formed a serene background. A group of souvenir vendors sat around the beach, peddling wooden dragons and overpriced drinks. Not quite the setting I was expecting when I imagined hunting dragons. From here, our group was marshalled into a dark, dingy hut. 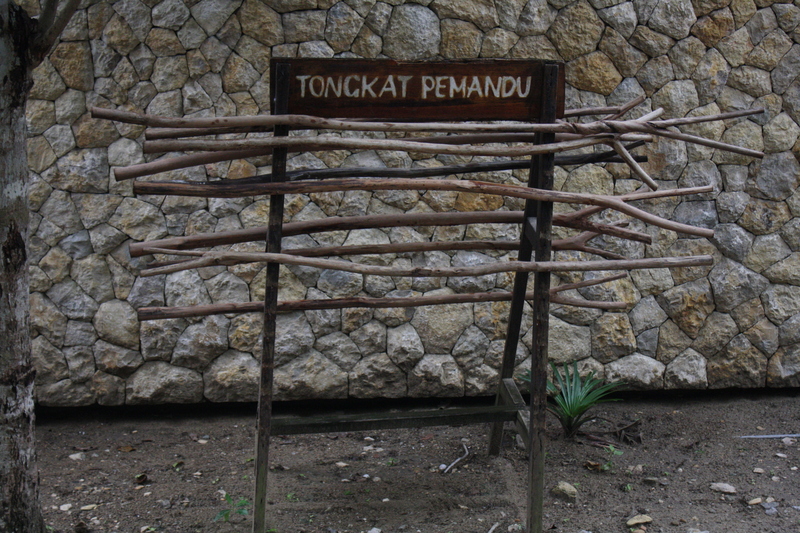 Aside from parting with a hefty park entrance fee, we learnt more about the significance of the sticks. We couldn’t be armed with anything more deadly for self defense – the dragons, although dangerous, were endangered and precious; we on the other hand, were expendable. I clutched my stick and exited the hut, only to be greeted by what looked like a large, sinewy, leathery cat. It was a baby dragon. As my fellow travel mates and I scrambled for our cameras, our guide casually reminded us to be vigilant and to make a run for it if we saw one charging at us. And with those not-so-reassuring words, we were led off, single file and flanked by two park rangers armed with their trusty sticks. Thick brush gave way to deep forest and soon I couldn’t find any visible traces of the path we were on. We’d been hiking silently through the wilderness, skipping over fallen trees and dodging flyaway branches. Our nervous excitement was palpable. Every little noise seemed to be amplified a thousand times over in the oppressive forest. My slow slog was interrupted by the urgent rustling of leaves off to the side and a snort from behind. With my heart hammering in my chest I turned and came face to face with a majestic horned deer, a delicacy favoured by the dragons, but found no trace of the dragons themselves. Sensing my disappointment, the park ranger gently explained that it was quite uncommon to see the really large dragons up close. No sooner than he had said that, I heard a loud, crashing noise up ahead and a harried looking ranger burst through the foliage. He conferred with the other rangers and pointed in the distance. There were two adult dragons up ahead. 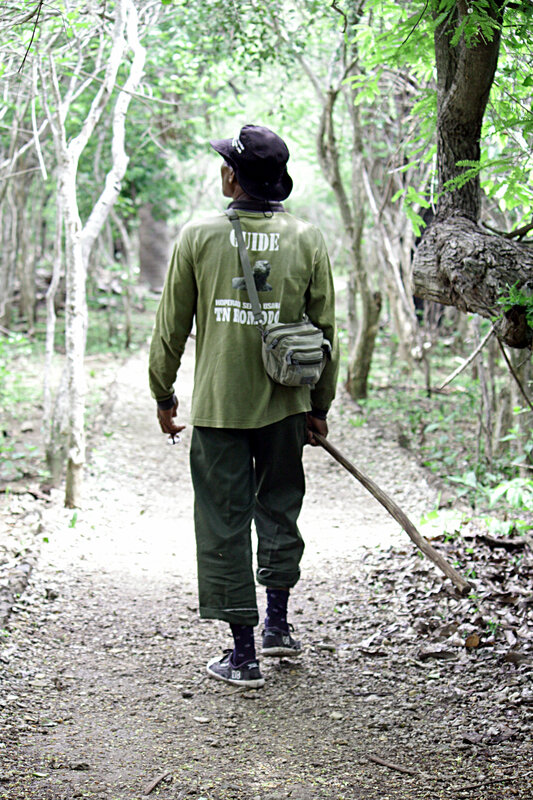 Our guide urgently reminded us to exercise caution and to follow behind him. “Hold your sticks!” he ordered and parted a wall of scrub and disappeared. Sticks in hand, fear etched across our faces, we followed, like an army following their general into battle. Small branches whipped against my legs, leaves smacked me across my face and the sweat from my forehead all but blinded me. But I powered through in the promise of a glimpse of a legend. I stopped short as I saw the ranger crouched low, finger to his lips. He beckoned to me and pointed emphatically behind a small outcropping of rocks and bush. I carefully parted the shrubs and my heart leapt to my throat. It was monstrous! 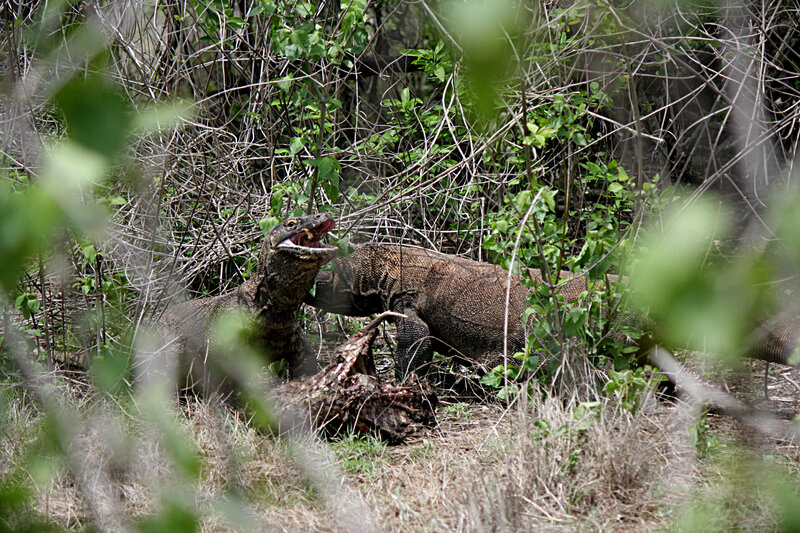 An adult Komodo Dragon, at least 8 – 9 feet in length, was ferociously gnawing on the remains of a deer carcass less than 30 feet away. The bottom half of the carcass appeared to have already made it into the dragon’s belly as it hung distended and grazing the ground; its forked tongue, unimaginably long and glistening in the afternoon light, flicked along the edges of the deer’s exposed rib-cage. 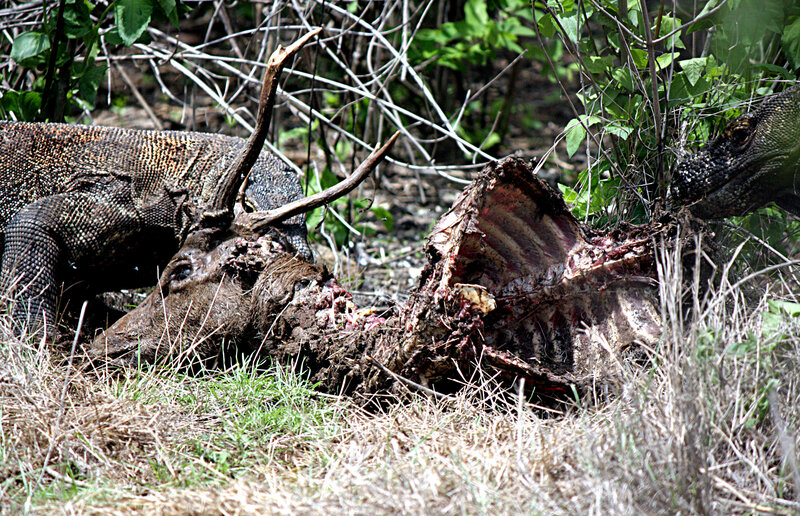 I watched, transfixed as the beast opened its enormous maw and sunk its serrated teeth into the deer’s exposed neck. I realized, as it resumed its feast, that I was missing out on the opportunity to capture some incredible photos. As I intently began shooting the scene, I heard heavy, thundering footsteps to my right and an even larger creature burst through the bush. I dropped my camera and bolted. I hadn’t gone a dozen paces when the ranger stopped and pointed behind me. I turned in blind panic, expecting to meet a gruesome end, and saw, in amazement, as the second dragon rose on its hind legs to attack the first. Both dragons rose up, like lava from a volcano, their mouths wide open, snapping and gnawing at one another, their colossal tails swinging like pendulums and crashing heavily on the ground, which actually shook beneath our feet. It was like watching a Nat Geo documentary unfolding before my eyes. After what seemed like eternity, they disengaged and thundered off in opposite directions. I too made sure I beat a hasty retreat, nearly dropping my phone this time which I was trying to record the encounter with. I looked back once more, and to my amazement, the dragons were now feasting on the carcass, in what appeared to be a tug-of-war, playful compared to what I had just witnessed. I could hear flesh ripping, bones crunching and loud gulping. With shaky hands, I picked up my camera once more and began clicking away as the guide whispered, “You lucky. This rare.” Indeed I was lucky. Lucky to have been able to witness these pre-historic wonders and leave with my life and limbs intact.